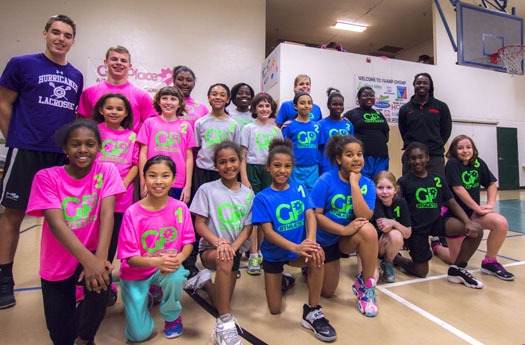 Winter Basketball – Girls Place, Inc.
Join us for an exciting season of basketball at Girls Place! Basketball is offered to all girls in 1st-6th grade. The girls will learn the fundamentals of basketball in a energetic and encouraging environment. In order to ensure our players learn the game the right way – we play games and scrimmages in a 3 vs. 3 format to encourage passing and ball handling skills. The cost for the 2019 Winter Basketball season is $75 and includes your daughter’s $20 Girls Place Membership for 2019! Every season we are able to provide a limited number of scholarship opportunities to our athletes. Priority is given to families experiencing financial hardship and extenuating circumstances that would otherwise limit their ability to participate. Families are required to volunteer in exchange for their participation fees. Please contact Ms. Charlie (Charlie@girlsplace.net) if you are interested in applying for a scholarship. This season, we will be using a financial assistance application to apply for a bartering scholarship. The administrative staff and the economic status of Girls Place shall determine the amount of members assisted and the level of assistance. Practices are held on Tuesday and Thursday from 4:30pm-5:30pm. The girls will scrimmage each other on Thursday’s during the last 30 minutes of practice throughout the season. Scrimmage rosters will vary during the season. Practices take place twice a week (Monday & Wednesday) for one hour and are held between 5:00pm and 8:00pm. Practice times are assigned when teams are announced at the beginning of the season and will stay the same for the entire season. Practices will start the Week of December 3rd. You will receive an email on November 30th to tell you what team your daughter is on with a schedule of practice days and times! Evaluations are MANDATORY. Your daughter must attend one of the evaluation days. During evaluations, your daughter will go through various drills to determine her skill level so that we can make teams as fair as possible. 1st/2nd Graders – Evaluations will NOT take place for this age group. For the 1st and 2nd graders, they will be participating in a developmental league and will have scrimmages on Thursday from 5:30-6:00. Our coaches are all volunteers from the community who are passionate about basketball and giving back to their community. We rely on our volunteer coaches to provide a nurturing and enriching learning environment. We want to teach our girls how to play sports – starting with a solid foundation of the fundamentals while gradually implementing new skills and challenging them throughout the season. If you are interested in coaching this season, please complete our application! All coaches are required to complete to a Level 2 FDLE Background Screen prior to coaching. Sponsorships and donations are vital to the success of the athletic program. If you are interested in sponsoring a team or the general athletics fund, please complete the sponsorship form and contact Ms. Charlie via e-mail (Charlie@girlsplace.net) for more information.